Integrity is a strong wholeness. The fabric of the being of a thing can't be broken. A bucket with one hole in it is lacking integrity. It's not a good bucket. A frayed rope lacks integrity. No matter how long or strong the rest of the rope is, that frayed part keeps it from being a good rope. It's exactly why every person who hopes to have a positive influence on any other person needs to figure out how to find and maintain as much integrity as possible. This is a quote I will type out and tape around my house! I have been following the thread, despite no current WoW players in this home. For me, his principle ties so much of unschooling, which ties together living well. This also addresses the root of the rut I fell into recently, and am climbing back from steadily. I am even thankful for the recent 'rut' and all the things I learned and continue to learn about integrity and what that means for me in relationship to others. 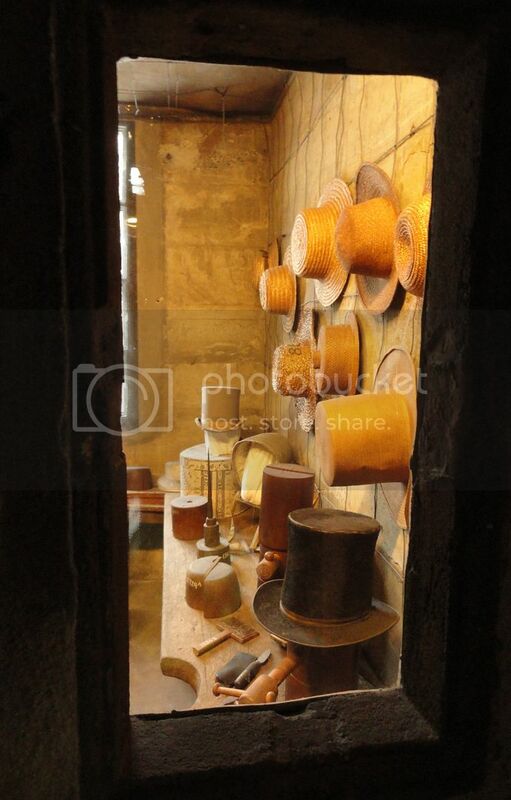 These hats are in a museum in Pennsylvania, in a reproduction milliner's shop. Recently Just Add Light had a quote and link to something by Pam Sorooshian about whether one should be a child's friend, or parent. Pam knows one should be both, and explained that elegantly. I was with a group of home ed families in France, some unschoolers, others in the various stages of consideration of unschooling, and someone asked me to tell how I am as a woman. Bea Mantovani was the translator, and said the question didn't really translate. The questioner tried to clarify. She said I had spoken of my husband, and of being a mother, but how was I as a woman, separate from that? I remember my confusion better than my response. One thing I said was that I AM a mother. I suspected, and it was later confirmed, that it was a socio-political question, a feminist concept about identity above and beyond motherhood. But the question sets motherhood in a low position, if only the brightest and the best exist apart from and outside of that, and if to have no answer made me unaware or less whole. For one thing, though, I was in France speaking to people because I had been invited to do so. I've written thousands of thousands of words about parenting and how children can exist in a peaceful world of easy growth in all directions. I'm a changing-the-world woman. But even that didn't answer the question, because it still was an extension of mothering, which I had explained had involved sharing and modeling since I nursed babies at La Leche League meetings. I would most like to be known as a woman of integrity, and for that to be true, I can't deny or reject any aspect of my being. I can't divide myself into parts and still be one integral whole. Any hat I might put on is still on my own head. Not the kind of "I was unschooled one summer" or "We unschool science and history, but not math or reading" kind of so-called unschooling. REAL, deep, committed, clear, purposeful, focussed, heartfelt whole unschooling. If it moves from the realm of rules to principles, then how could one really compromise without also compromising integrity? That's where I am with it, and have been for many, many years. I can't NOT unschool because it has become the way we live and think and treat one another. Is that spiritual? I think so, but it's not in the prayer/spirit vein. No angels are alighting. It's a change of mental posture and attitude, which is designed to improve the thinking, decision-making basis [i.e. philosophy], and the integrity of the individuals. That changes behavior. Or sometimes people change behavior without really believing there's going to be a resulting change in belief or others' reactions, and when the reaction comes, the belief follows, and the transformation starts cookin'.